Gastric ulcers, just as they may be found in humans, are also found in horses. A veterinarian will be able to ascertain the presence of such an ulcer by inserting a fiber optic tube via the nostril through the esophagus and into the stomach. A healthy stomach should be pink, yet if a horse suffers from gastric ulcers, they will show up yellowish-white against a blood red background. Present-day research is revealing that this condition is in fact so prevalent in horses that it demanded the development of a new drug to help horses suffering from this illness. breakthrough. Instrumental in the research was the use of a two-meter endoscope which permitted researchers to sample larger portions of a horse’s gastro-intestinal tract without being hindered by the lack of length that the endoscopes then in use presented. The most surprising aspect of the research began with a study that sampled about 100 healthy looking foals from a variety of stables. When the animals’ gastro-intestinal tracts were probed, about half of them were found to possess the tell-tale lesions in their stomachs. Taking the research further, the scientists proceeded to test a number of race horses, only to find that the number of affected animals reached a staggering 90 percent! Added to this study were then those animals who were neither foals nor race horses, but where the owners were concerned because the animals had a poor appetite or simply suffered from some kind of abdominal pain. They, too, had the lesions in their stomachs. 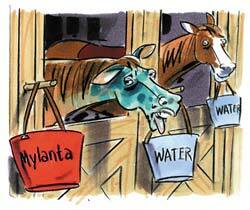 In the past horse trainers simply resorted to using Mylanta and horses who showed no symptoms were assumed to be fine. Instead, it appears now that even animals that are asymptomatic are still affected. While in humans the presence of ulcers is most often linked to stress, this conclusion does not fit in the animal kingdom. Instead, it appears that the reason for such stomach problems is the fact that horses are no longer able to continuously graze, but instead have to follow specific feeding patterns – this is also the reason why race horses who are on rigid schedules are more affected than pleasure horses. Ideally, a horse will eat intermittently to have enough food stuff in its stomach to absorb the digestive acids which it always secretes. This prevents the stomach’s lining from being damaged by the acid. Aided by the horse’s saliva which further contains acid neutralizing agents, the pH balance of the stomach remains constant. Yet when the horse is not able to continuously graze, its stomach pH balance suddenly drops to such an extent as to be associated with the causation of ulcers. While in the past antacids as well as histamine type II receptor antagonists were utilized, the latter was found to be more effective. It permits for protection of up to 24 hours, and this of course is invaluable for race horses. Of course, there are different kinds of histamines, and it is imperative that the use is discussed with a veterinarian. Another fact to consider is that the presentation of ulcers will require continuous treatment. This shows that prevention is indeed best, and if you are able to let your horse continuously graze, you will be rewarded with an animal that does not suffer from ulcers. In the meantime, it is also important to note that the recent advent of the three-meter endoscope will give rise to more studies, specifically as it concerns the presence of ulcers in the stomach’s glandular region. Read the next horse health tips article on Rainrot.